My God, has it really been 10 years since the first Audi R8 V10 came out? It was a mid-engine beast ubertoy that was launched during the heart of the Great Recession, when only the wealthy had money, and it is still alive to this day. That’s a reason to celebrate, I suppose. Audi is doing just that, celebrating the R8 V10’s 10-year anniversary with the Audi R8 V10 Decennium. And it costs a whopping $214,995. For that $19,095 premium over the V10 Performante, would one get a bump in power? But some new paint, special “Decennium” logos and *exclusivity*? 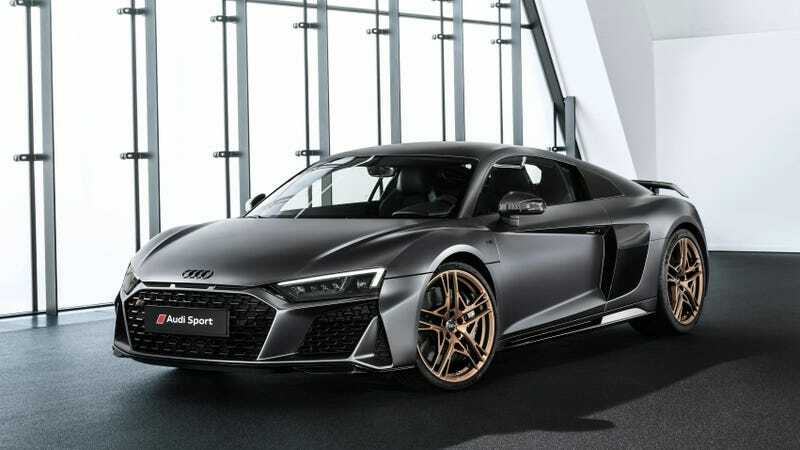 The R8 V10 Decennium will use the same 5.2-liter V10 from the R8 Performance models, meaning that it’ll make a claimed 602 horsepower, 413 lb-ft of torque, hit zero to 60 in 3.2 seconds and achieve a top speed of 205 mph, all according to Audi’s press release. The Decennium will only be offered as a coupe, because TRUE anniversary heads need a roof. It will have milled 20-inch wheels and intake manifolds finished in an attractive matte bronze, which I honestly dig. The side blades, rear wings and wing mirror housings will be made from glossy carbon fiber. Inside, the interior is nearly all black, with a diamond-stitch pattern in the seats with a copper colored contrast, those last three words of which you should try saying like ten times, quickly. “Decennium” logos can be found on the center console, doors and the sill trim inlays. Also, a logo projector will beam the word on the ground when the door is opened. Bless. Audi is only making 222 of these things globally, and 50 of them will make it to the U.S. All 50 of them will be painted a Mythos Black metallic, which I assume is a shade of sparkly, slightly darker black. And I guess while I have you here, here’s all the pricing information for the 2020 Audi R8s. The original R8, as we have said before, was the best one. It had revolutionary looks and a gated shifter, for crying out loud. After the V8 version came the V10 version and it’s actually kind of amazing that it even still exists today, a time when everyone else is has gone either hybrid or forced induction. That V10 probably isn’t too sustainable in the coming years, but I’m happy that it exists at all. Give me linear power delivery and a high redline any day of the week.